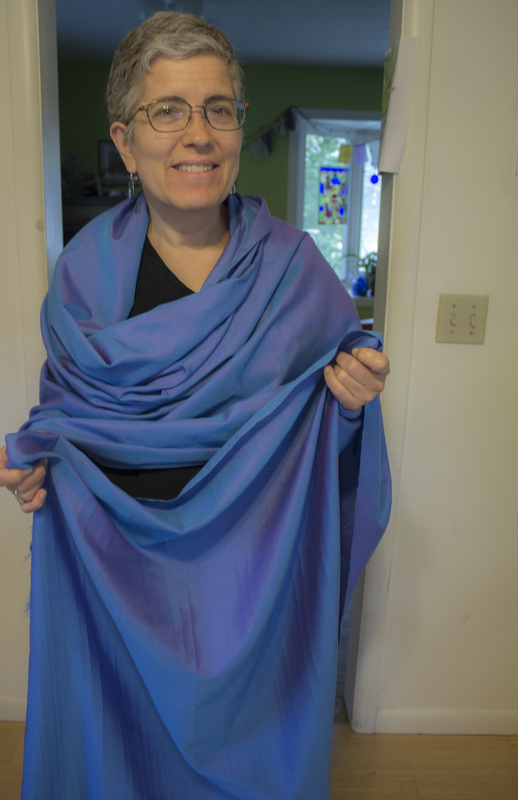 The shot silk project is finally complete and I now have three-plus yards of shimmering iridescent silk: mostly periwinkle blue except where the light catches the violet weft and makes the cloth shimmer. This silk yardage, with 50 threads to the inch, is the most ambitious and most beautiful thing I have ever woven and it completely lives up to my hopes. The cloth has a nice “hand” that’s midway between soft and crisp, and it’s so lightweight that it can be folded repeatedly into a small rectangle that has scarcely any weight, like the Elven-cloaks of Lorien. I learned several things from this project. 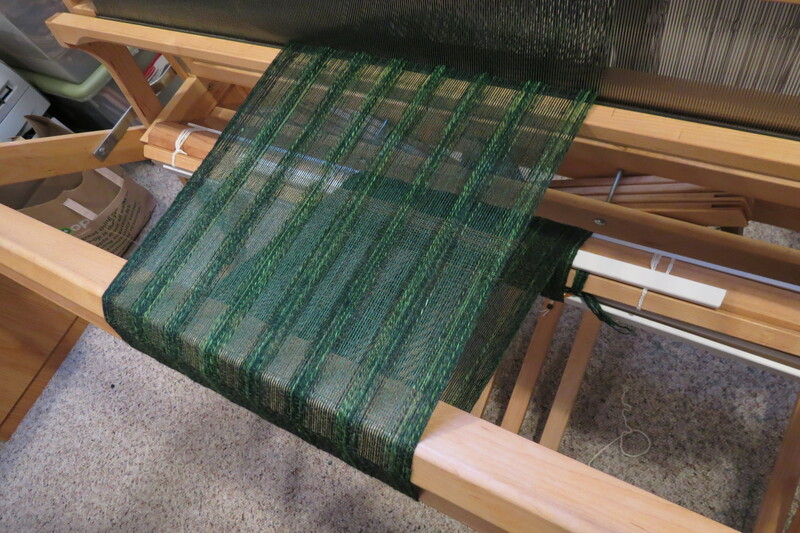 First, it is an error to zone out while weaving. Occasionally the shuttle would catch a lone thread and incorrectly pass over or under it, so I needed to be alert. When there are 30 rows of weft in every inch, “reading” each thread from left to right requires extreme in-the-moment mindfulness, which is the opposite of zoning out. I also learned a lesson about the relationship of the beater to the beaten cloth. There is a “sweet spot” on my Louet Spring loom (and probably on every loom) which is only about an inch deep, and the edge of the fell (the finished cloth) needs to remain centered within this sweet spot whenever the warp is advanced, lest color imperfections immediately become visible. I used to believe that these visual imperfections that appeared each time I advanced the cloth were due to improper tensioning. But instead, it has to do with the angle of the beater as it it smacks against the edge of the fell as I weave. When I learned to advance the fell only one inch at a time, maintaining position within that sweet spot, the color was always consistent. 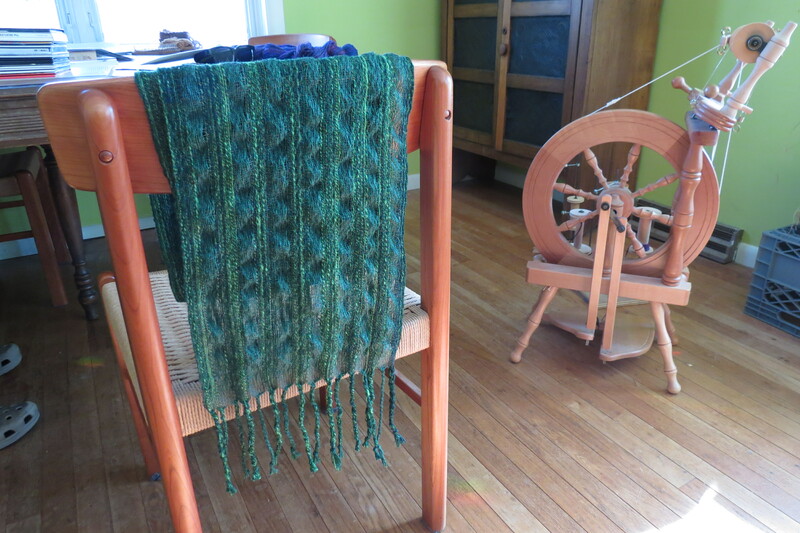 This is not a real problem with coarser woven projects such as scarves or dishtowels, but when weaving with fine silks, color inconsistencies can ruin your project. Because I figured this out as I went along, the last half of the yardage looks neater than the first half. My original intent was to have a garment tailored from the yardage, but because I have cancer, it makes little sense to make clothing that I might not get to wear much. I am considering all options. One idea is to cut off one yard and use that smaller piece to make a tie and pocket square for my son, who enjoys “suiting up”, along with a number of hemmed handkerchiefs to give as gifts to friends. This would leave a large piece two yards long which could be used as a shawl. But I’m still open to other ideas. I will consider all good suggestions! Awesome, interesting and oh so gorgeous! I like seeing the yardage sari-esque wrapped around you, Carrol. I don’t have any ideas about dividing up the fabric, but I think it’s because I love the sheer volume of shimmering iridescent color. This is so very pretty on you. I have always loved the idea of having things that are one color but, have another color in them. One thought I had is you could make a table runner or maybe some napkins. I also think of the idea of making something nice for your son and your friends is a sweet thought. I’m so proud of you and happy for you. I know finishing it was a ‘mission’. In the 1940’s my grandmother was hosting a meal for visiting relatives. For dessert she had made a pound cake. A visiting nephew (trying to give a compliment) said of the cake, “It’s almost as good as store-bought”. So I will say, having actually touched your silk masterpiece, it is almost like store-bought! 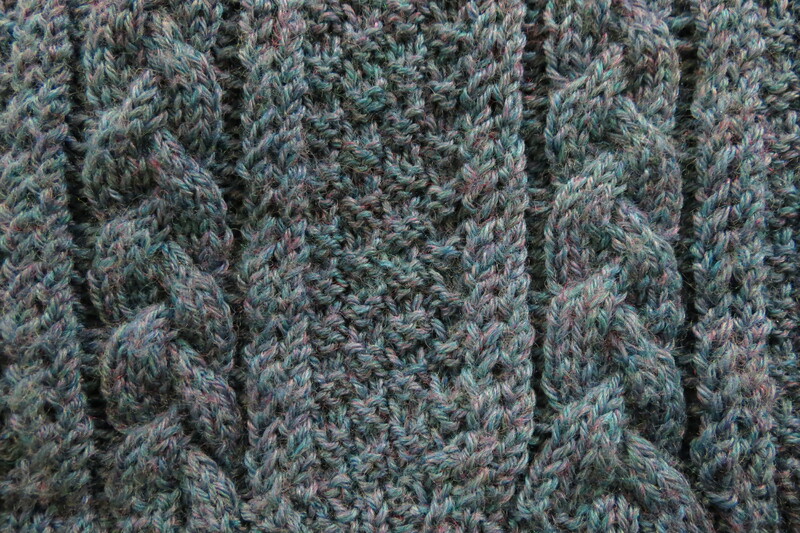 It is so thin and light, it is hard to believe it was hand woven – and by someone I know and love! Thanks so much for the kind words, Jenny! Yes, it meant a lot to me at this time of life. 🙂 Thanks for your ongoing support! so beautiful, Carrol. I like the pocket square/tie idea for Miles but it sure looks beautiful as a Lorien-cloak or sari garment too! Thank you for inspiring us. This is a most beautiful cloth and will show best if it can move and reflect. So, something meditative and flexible like a shawl or a free falling wall hanging. It will have a powerful presence. Really you should use it in whatever way would give you a sense of joy. Wonderful work! Incredibly stunning fabric!! And I think it’s wonderful that despite what you’re going through, you still want to create something beautiful.